The world needs more cyclers than ever! I am incredibly privileged to be a part of this silent revolution. Being a Bicycle Mayor I will focus on my mission, to have more and more bicycle tracks, changes in peoples mind-sets towards cycling, and increased use of bicycles to reduce traffic and pollution level by introducing bicycle sharing projects in the city, big corporate houses, school and universities campuses. I aim to motivate students and professionals to cycle to their schools and work to increase cycling in everyday lifestyle. 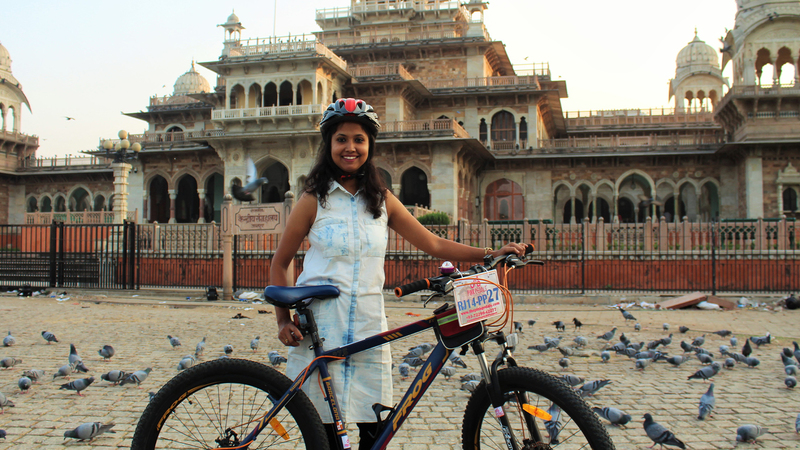 I want tourists to cycle and see the beauty of the Historical Pink City. I have already started inspire a love of cycling in children by organising Juniors Cyclothon in Jaipur where “Every Rider Is a Winner”. The last event was held on the 23 rd of December, 2018 where more than 300 children participated and the youngest rider was of 2.3 years old. The major challenges I am facing in my city is the mind-set of people towards bicycles, traffic systems and lack of cycling tracks. Jaipur being a tourist destination and a land of rich heritage, congestion of heavy traffic on roads has made it difficult to cover even one kilometre in one hour during busy hours of the day. Introducing cycles in such car centric environment will be one of my major obstacles. I feel if I can convince women of the family to ride a bicycle then it becomes quite simple to convince the entire family to start cycling. So, getting more women on bicycles will be a challenge that constitutes half of the percentage of the society. Cycling as a form of recreation is loved by many in my city; however adapting cycling in their daily routine for commutation and health will be a major challenge. My first step will be to fight for the rights of the cyclists and raise voices for the dedicated cycling tracks. I will be working hard on my project to promote cycling amongst kids through JUNIORS CYCLOTHON in my city engaging more kids and more schools. Keeping my mission in mind, I can proudly announce that I have been able to convince and motivate India’s biggest integrated city in Jaipur to have Public Bicycle Sharing program with the help of my initiative Pink Pedals and will be launching it soon. Being a Bicycle Mayor I will aim to give fresh air to breathe, healthy people to accelerate my country’s growth, systematic traffic which will create benchmark for other cities to inherit.